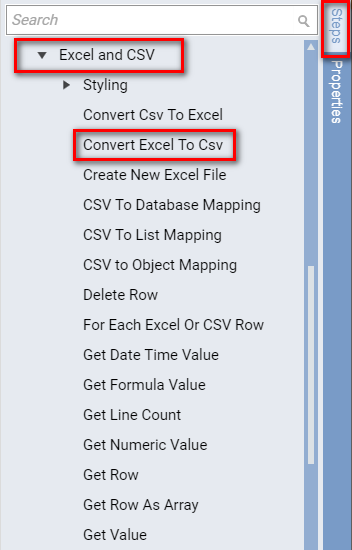 The Convert Excel to Csv component converts Excel-formatted tabular data to CSV format. 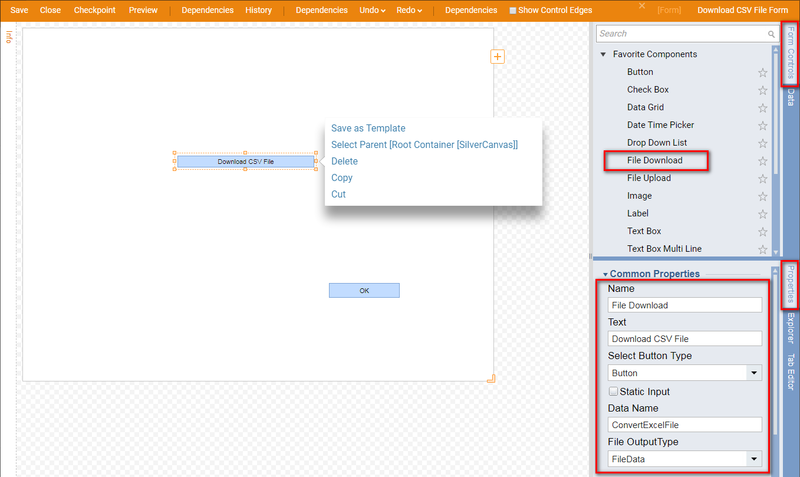 To use the Convert Excel to Csv	component in the Flow Designer, drag it to the workspace from the Components	panel&apos;s Data > List > Excel and CSV	category. 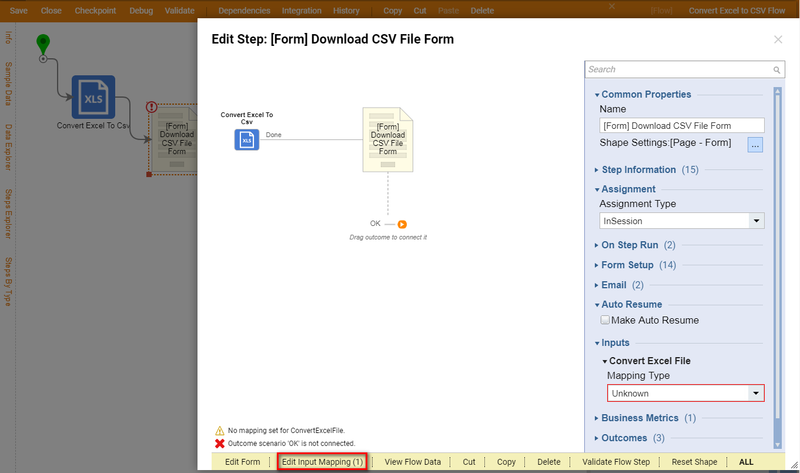 In the example, we will create a flow that converts the data in an Excel file to CSV format and use a form to perform the action. The form was created for this example. 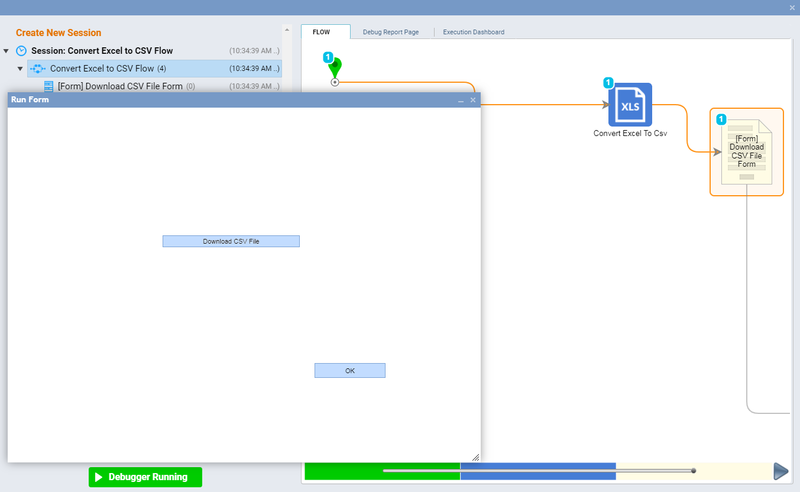 Begin in the portal by navigating to a Designer Folder	and clicking the Create Flow	button. 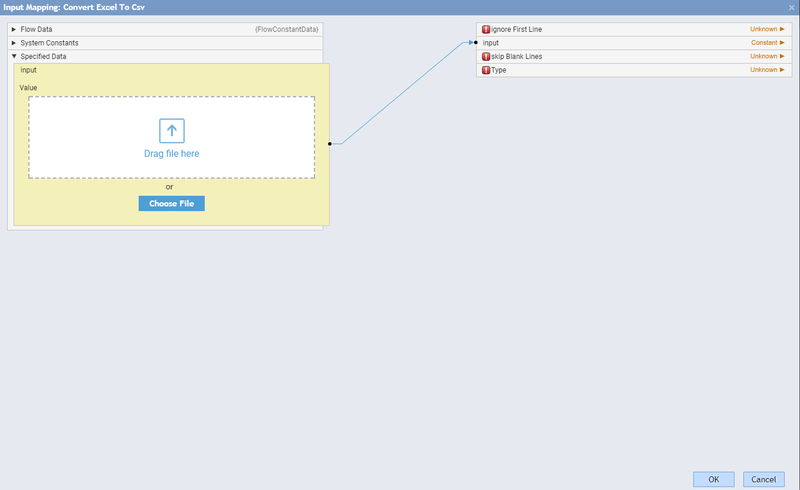 In the resulting New Flow pop-up, give the flow a name and click Create	to open it in the Flow Designer . 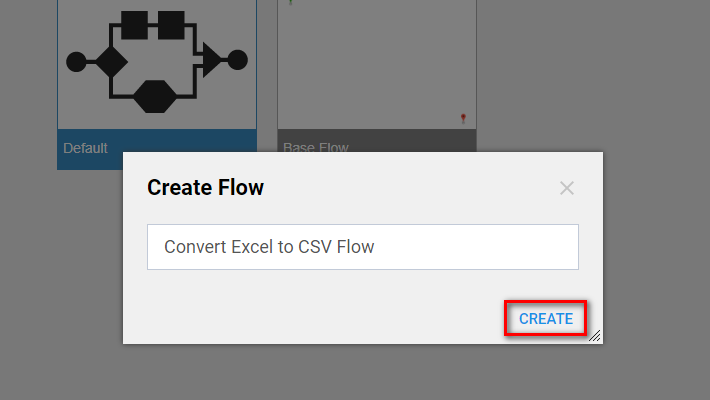 Select the Convert Excel to Csv	component from the Flow Designer&apos;s start-up window, from All Steps [Catalog] >	Data > Excel and CSV	category. Click Add	to add it to the workspace. To configure this component&apos;s inputs, click on the Convert Excel to Csv	step and click the Edit Input Mappings	link in the Properties	panel. In the Mapping Editor , change the mapping type of input	to Constant	and click the Choose File	selector. 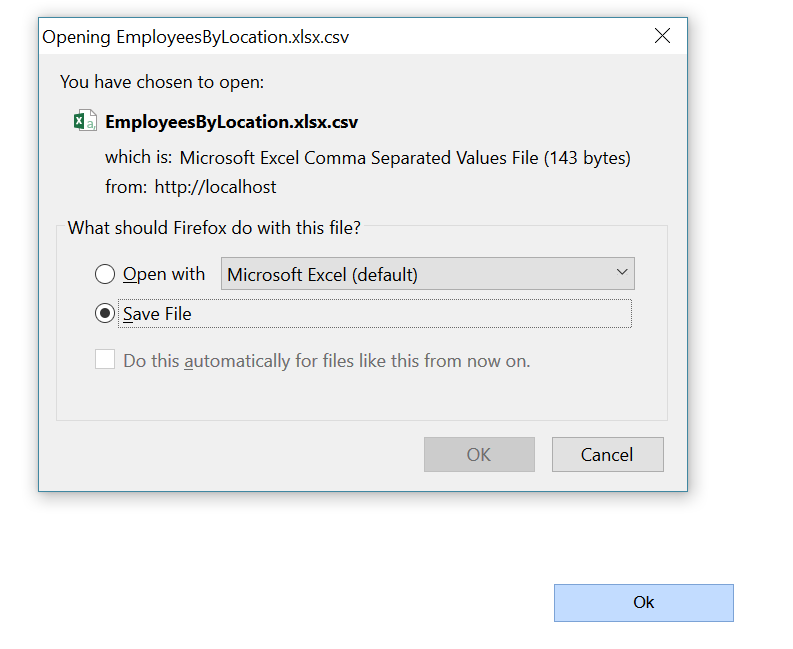 In the resulting Open	pop-up, browse to and select an Excel file from the local machine and click Open	. Next, change the mapping typeof Type	to Constant	and, in the Value	dropdown, select Excel_xlsx	. This reflects the type of Excel file. 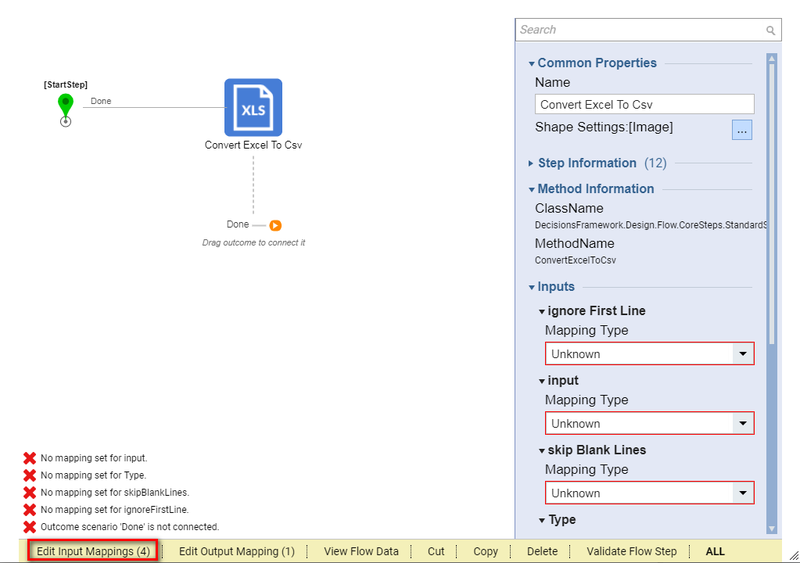 Also change the mapping type of skipBlankLines	and ignoreFirstLine	to Constant	, select both Value	checkboxes to designate each option as "true," and close the Mapping Editor by clicking OK	.
Connect the outcome paths of our flow, select [Form] Download CSV File	and click the Edit Input Mapping	link in the Properties	panel, or from the step&apos;s Action	menu. 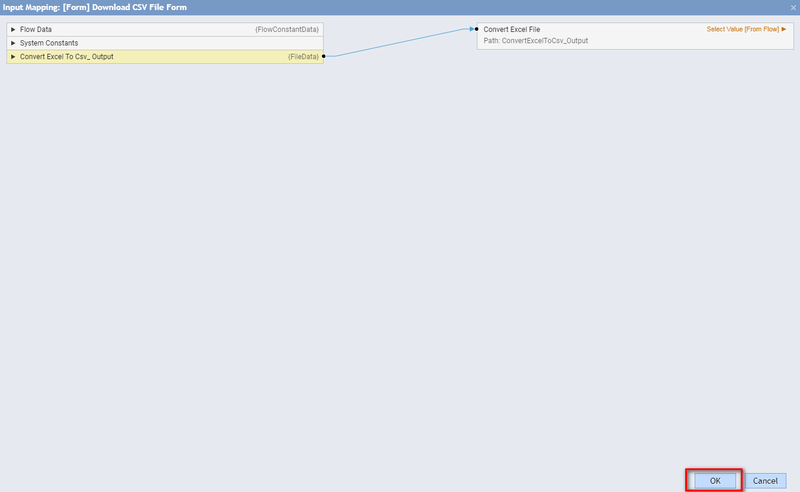 In the Mapping Editor , map ConvertExcelToCsv_Output	to ConvertedExcelFile	and close the Mapping Editor . Connect the form to the End Step. 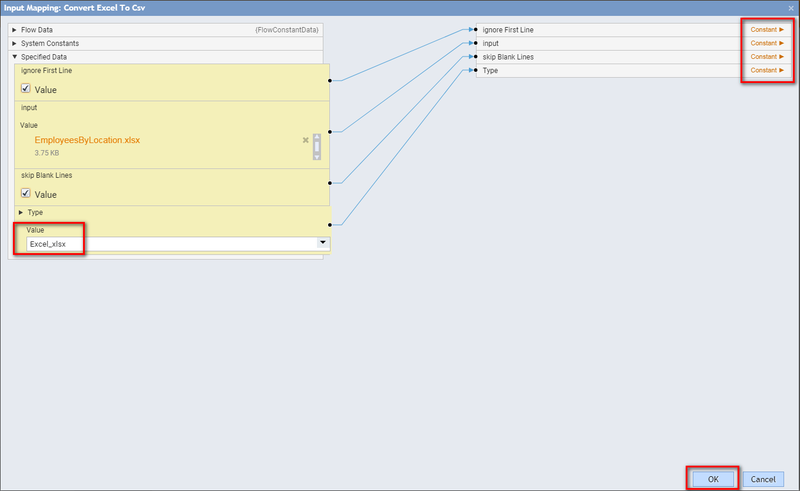 This completes our flow; run it in the debugger to test. Under the Form	tab, notice the pre-designed form. 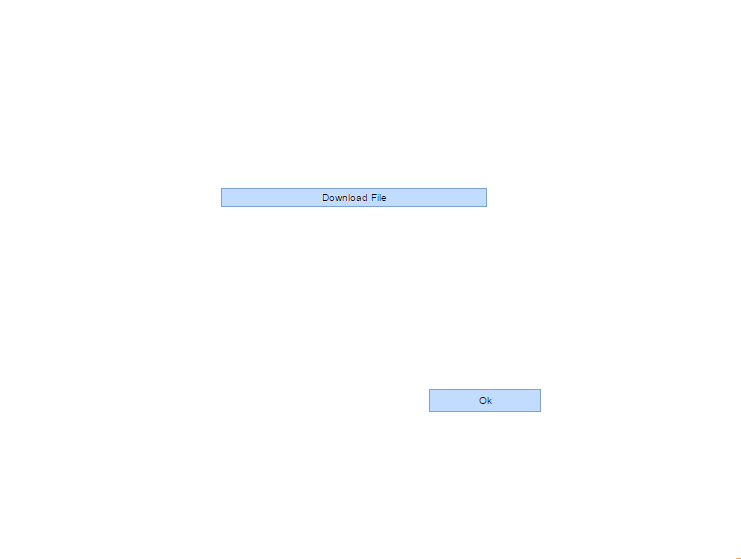 Click the Download CSV File	button. In the resulting Save As pop-up, give a name to the new CSV file and click Save	.